Pickups are great for hauling heaps of whatever, but less optimal for keeping your tools organized. Unless you’ve got a nice cargo-sorting system like this old Ford Super Duty’s sweet disappearing bedside tool box. I mean, it looks amazing, though I think I see why this tech didn’t catch on. This brief clip, which was posted to a Facebook group about farming by somebody named Steve, shows a Ford Super Duty dually magically lifting its bedside to reveal a rack of shelves holding tools. My cursory research has revealed exactly no details as to who made this or how or why, so at this point all I think I know is what the video caption reads: “One of five made in 2000.” If you know more than that, now’s your time to shine in the comments, by the way. Conceptually, this seems pretty brilliant. Why not utilize all that extra space between the truck’s bed and the outside for, uh, utility? The execution here seems decent, too. The fiberglass bedside is lifted by what appears to be a hydraulic lift controlled by a switch near the tailgate, like what plenty of modern luxury SUVs have for their rear cargo hatches. A little strip of rubber weather stripping along the bottom appears to seal the interior cabinet against the elements. A dual rear-wheel pickup, even an older one like the white rig in this video, would have a pretty high payload capacity so the vehicle shouldn’t lug too much with all these accessories hiding in its bedside. 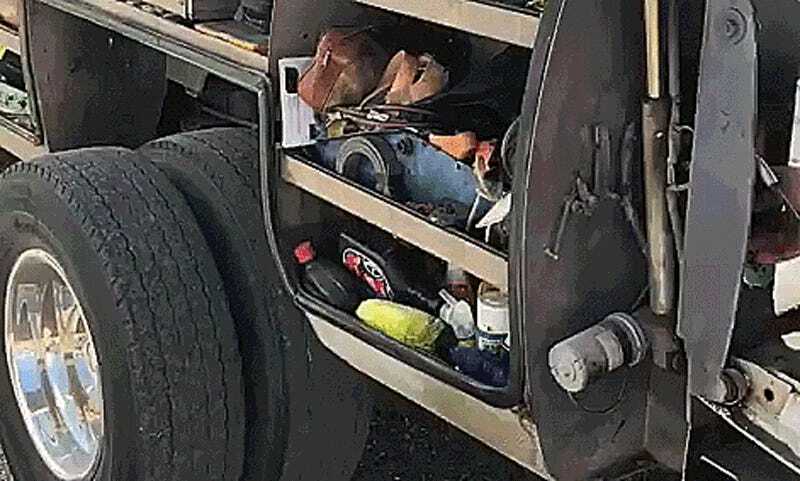 In fact, the truck would probably ride a little better with these “drawers” loaded up since its rear shocks are optimized to run with a little weight. But I feel like, any time you hit a bump, this is going to make an unbelievable racket and beat the hell out of whatever you’ve squirreled into these shelves. I’m guessing the system, which almost assuredly was aftermarket, was also pretty expensive. Still, it’s a pretty trick piece of kit and puts the Ram Box to shame. Except, you know, the Ram Box is bedside storage that actually made it to production and this is an obscure novelty. I’m really just posting this in hopes that somebody knows all about it and will share their knowledge in the comments, anyway.